This card is for a CAS-ual Fridays challenge - which is wallpaper and the current Case this Sketch challenge. 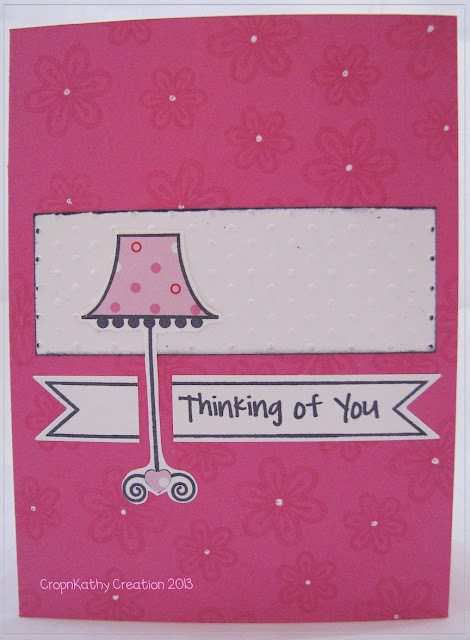 The paper is all Gina K as is the adorable lamp, flowers and sentiment stamp. The die with matching stamp is from paper smooches. The embossing folder is the cuttlebug swiss dots and ink is Memento. Thanks for stopping in. I think I will try a couple more for the wallpaper challenge. Ooh, clever - Love how the lamp divides the bottom element into two! Thanks so much for playing along with us at CAS(E) This Sketch this week! This is so cute! Lovely card! Thanks for joining us this week at CAS-ual Fridays Challenge! Very cute and pink card! Thanks for joining us this week at CAS-ual Fridays Challenge! This is so sweet, and a clever use of the sketch! I love the subtle floral stamping on the background. Thanks for sharing this with us at CAS-ual Fridays!